Foxit Software has unveiled Foxit Reader 8.0, the latest version of its PDF viewer and creator for Windows PCs. The reader, renowned for its lightweight and speedy nature, introduces support for Foxit’s new online ConnectedPDF Document Management System. The new release also adds support for Touch Mode on supported models as well as Dropbox integration. Users also gain a handy new auto-save PDF option to protect against crashes or power failures. When users launch Foxit Reader 8.0 for the first time, they’ll be invited to sign up for ConnectedPDF. This is Foxit’s new online Document Management System, and works with specially adapted PDF documents (cPDF format) to allow users to edit PDFs through their web browser and more easily collaborate with others. When signed into ConnectedPDF in Foxit Reader, users will be able to create and register new versions of cPDF documents, request a file, configure permissions, make comments and join a connected review without any third-party servers. Users also gain control over document data and settings as well as file access history and messages. 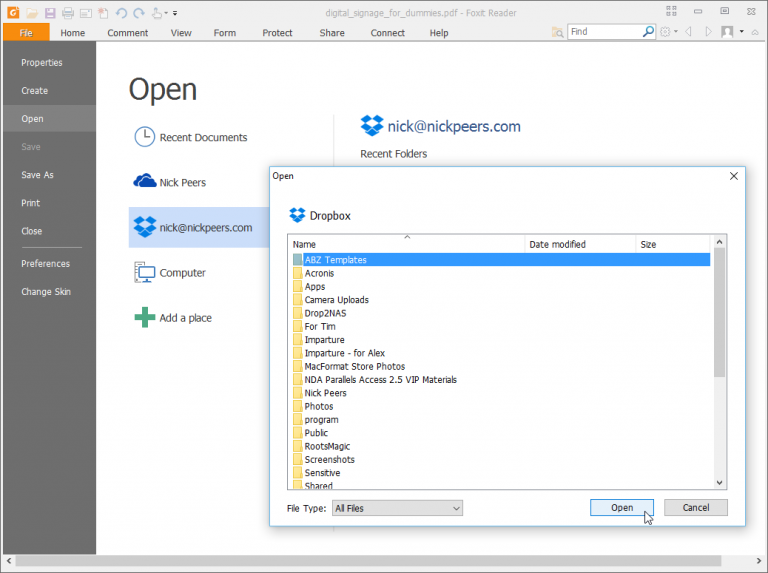 Version 8 also adds Dropbox integration to existing support for OneDrive and Google Drive, allowing users to easily access cloud-hosted PDF files direct from the Foxit Reader File > Open dialog. The new release also fully supports Touch Mode when working on touch-screen devices, while users also gain the ability to convert .msg email files to PDF simply by right-clicking the file in File Explorer. Foxit Reader now also adds an auto-save feature -- set to five minutes by default, but configurable through the File > Preferences > Dialog -- to protect documents in case of power failures or program crashes. Improvements in version 8 include the ability to preserve formatting when copying tables from PDFs, the ability to view custom metadata and support for printing PDF sections or pages directly from selected bookmarks. Users can additionally cut, delete and move multiple bookmarks at once and pin frequently accessed folders from cloud platforms to the File > Open and Save as panels for quick access. Foxit Reader 8.0 is available now as a freeware download for PCs running Windows 7 or later. Some PDF creation features also require Microsoft Office 2007 or later.